Size Toddler (1-2 years), the perfect dress to practice buttons and buttonholes! 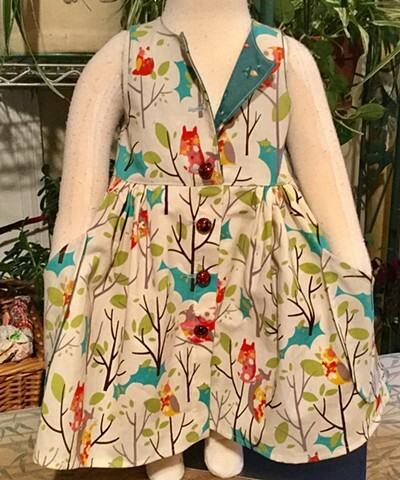 Lively abstract trees and birds design, bodice and pockets lined in flower buds on a green ground, fully gathered skirt closes all the way down the front with 6 rare antique glass ball-shaped buttons with many colors. Curved pockets to stash snacks or toys, sleeveless, size Toddler (1-2), measures 21” across chest and 18” shoulder to hem. $50,100% cotton, made by the designer herself and shipped free to any address in the U.S.